Join the Association for Public Art (aPA) for a Dog Walk & Public Art Tour along Philadelphia's Kelly Drive as part of aPA's #ArtPup campaign! 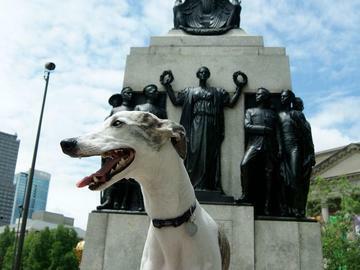 We invite you and your furry friend to get outside and meet other dog-lovers while seeing some of Philadelphia's renowned collection of public artworks. We will begin at Iroquois Park (24th and Pennsylvania Avenue) and explore the area around the Philadelphia Museum of Art and Kelly Drive. The tour will end at the front of the Art Museum Steps. The tour is also a great opportunity to snap a picture of your dog for the #ArtPup photo contest! Top three photos will win great prizes. Visit associationforpublicart.org/artpup to learn more. Only one dog per person allowed on the tour, for the safety of all participants and their pets. All dogs must remain on a leash at all times, and adhere to the dog regulations and best practices set forth by the City of Philadelphia and the Commonwealth of Pennsylvania. Please consider whether your dog's temperament is suited for this type of environment, and please curb your dog.